03/21/2018. 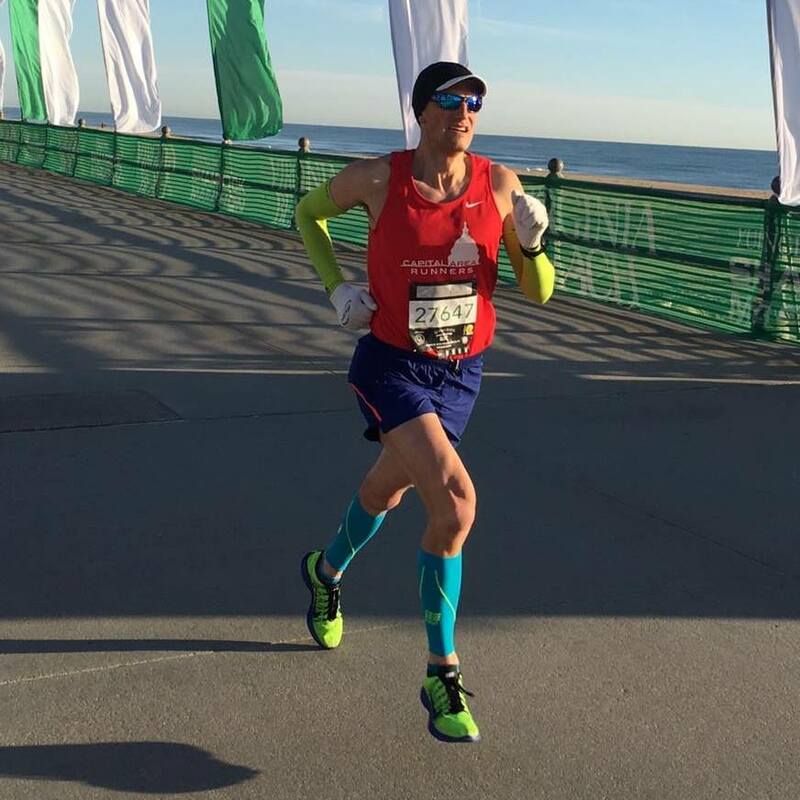 VIRGINIA BEACH, VIRGINIA – Hosted by the Shamrock Marathon’s Towne Bank 8K, the Championship Race went off at 7:45 AM on St. Patrick’s Day. The mornings before race day had temperatures in the lower 40’s but winds at 10-14 mph mostly although one day had 20+ mph winds. 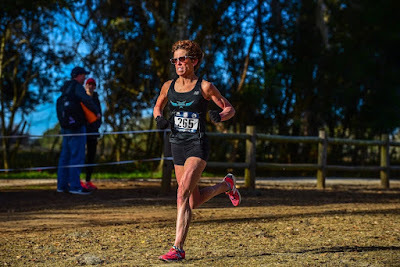 As it turned out, sunny skies and freezing temperatures, but little wind, greeted the USATF Masters 8K Championship competitors, fine conditions for fast running. American Records. Colorado’s Libby James, 81, a Hall of Famer, took full advantage. 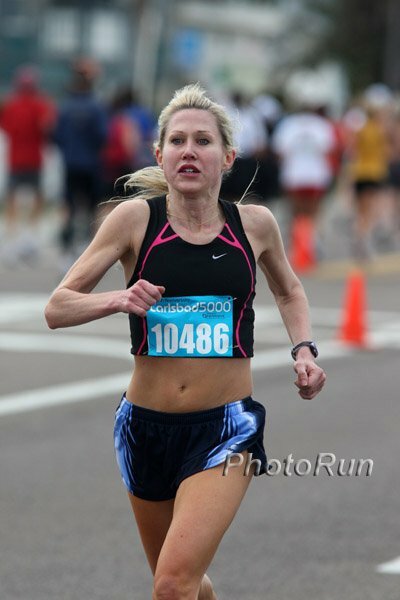 She shattered the American 80-84 Record, lowering Anne Clarke’s 1991 mark of 52:00 to 42:34. James will add this to her collection which already includes the 5K and 15K. Unless someone else has run faster than her time in the last 7 months, James also took down the World’s Best. As of August 5 2017, the World’s Best was listed as 43:49, set by Betty Jean McHugh of Canada in 2008. 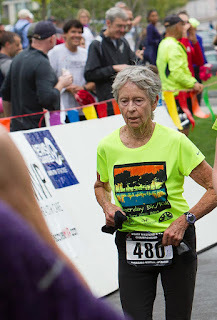 Her Boulder Road Runners club mate, Roger Sayre, 60, almost got it done as well, coming within 3 seconds of Norm Green’s 1993 Record of 28:07. If the World Best tables are still accurate, only two Brits, a Canadian and Jack Nelson, from Illinois, with a 28:00 in 2000 have run faster times. Pretty fancy stepping! 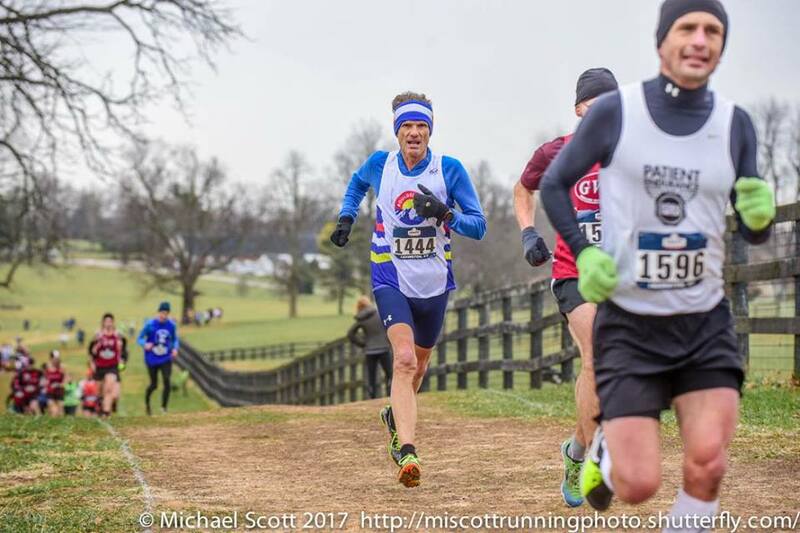 Roger Sayre in one of his last races as in the 55-59 division at 2017 Club XC Championships in Lexington KY, outrunning everyone over the age of 56 in the 10K race. Age-Grading. Age-Grade scoring is the best way to compare performance for age across all Masters competitors, with 100 being the top end and higer scores being relatively faster. The Masters LDR Committee refers to scores above 90% as World Class, and those above 80% but below 90% as ‘National Class. But USATF also recognizes performances between 85.00% and 89.99% as being worthy of a Silver Elite Performance medal rather than the Bronze medal available to those scoring between 80.00 and 84.99%. In that context I am starting to refer to the higher of the two levels as ‘International Class’, hoping that the term will catch on. James, not surprisingly, scored the top age grade of the morning with 99.04%. That is a higher age grade than she achieved when she took down the 5K and 15K American Records in 2016. Others who walked away with Age-Grading prize money included Athena Track Club teammates in 2nd and 3rd, Marisa Sutera Strange, 54, 92.57% and Doreen McCoubrie, 56, 91.87%. This is a repeat for them; they finished 2nd and 3rd to a different runner from Colorado last year, Edie Stevenson. Team Red Lizard teammates, Jeanette Groesz, 68, 91.82%, and Suzanne Ray, 65, 90.21%, rounded out the list of runners getting an Age-Grading payday. The top scorer on the Men’s side was Nat Larson, 55, from the Greater Springfield Harriers, with 92.90%. Last year he was 2nd Age-Grade in the 8K and won the 10K age-grading championship. It was quite a feat to beat out Roger Sayre, 60, for the age-grading title. Sayre’s near record performance age-graded at 92.45%. His rivals for 60-64 dominance, Club Northwest’s Joe Sheeran, 60, and Hall of Famer Brian Pilcher, 61, from Northern California, just out of hamstring rehab, were next at 91.96% and 91.74%. 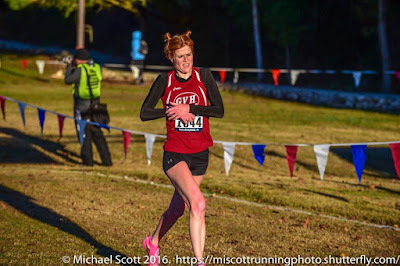 Pilcher took the title here last year and Sheeran took the title among the 60+ crowd at Club XC in Lexington last December. 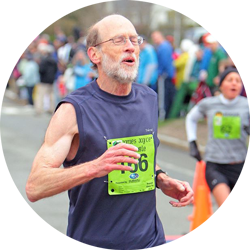 Philadelphia Track Club’s Gene Dykes, 69, known more for his Marathons than his 5k to 10K performances, surprised many by walking off with a top-5 age grade prize at such a short distance (for him)! Dykes wound up at 91.72%. It took a World Class performance or better to make the top 5 cut in Age-Grading this year; International Class would not get it done!--Wow! Overall Competition. 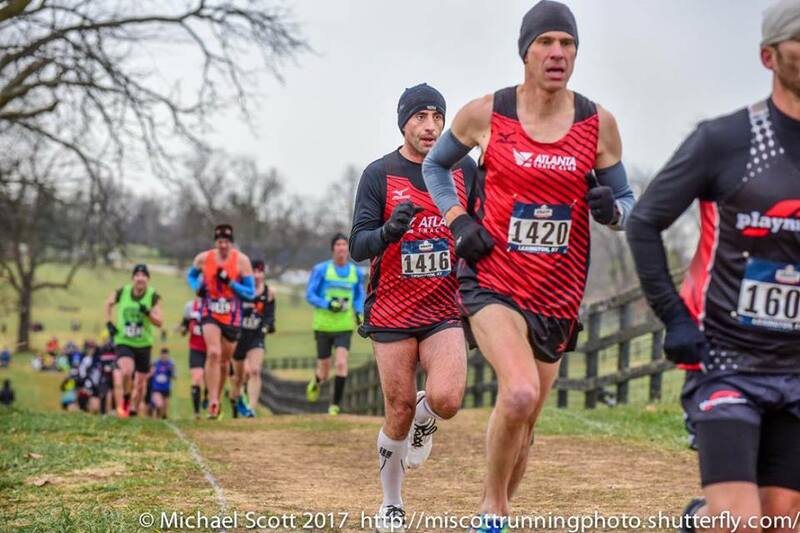 In the race to be first Masters Athlete across the line, it looked like a replay of the battle last year between Roanoke Valley’s David Angell and Philippe Rolly, of the Capital Area Runners; they took 1-2 last year. Angell went on to win the USATF Masters Grand Prix for 40-44 year olds and Rolly had a good fall season, winning the Masters Championship at the Chicago Marathon. Angell certainly was the favorite both as defending champion and because he had beaten Rolly and all other potential contenders at the Club XC Championships in Lexington KY in December. Cross Country races are good indicators of likely performance on the roads, but not perfect. Some running styles and abilities seem to be enhanced by the Cross Country environment and others the reverse. In any case by the 2 Mile Mark, the front part of the race had split in two. 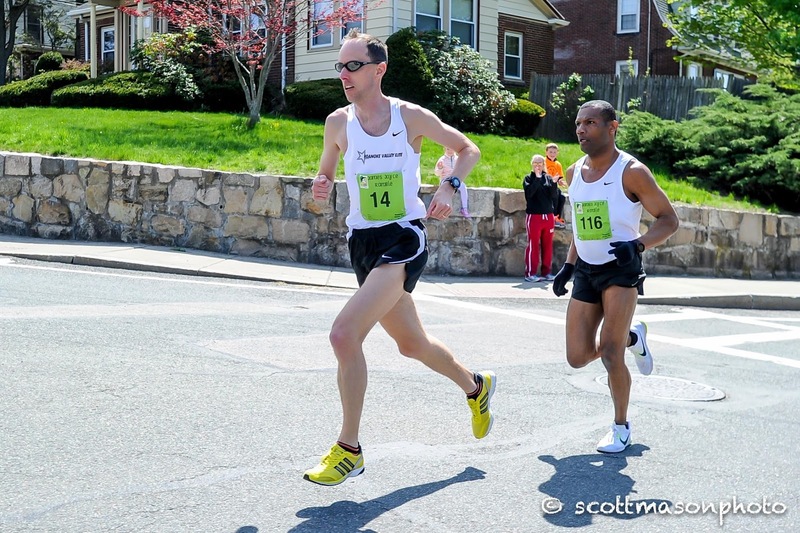 Angell, Rolly, and two other contenders, Giovanni Pipia of the Atlanta Track Club, and Mark Tompkins of the Colonial Road Runners were bunched at the front, crossing the two mile mark in 10:13 (net). Garden State’s Jonathan Frieder and Sam Teigen were within striking distance about ten seconds back, with Musa Gwanzura and Greater Springfield’s Mark Lemme another ten seconds back. The gaps between those groups grew as they headed northwest on the Boardwalk along the ocean. Tompkins fell back first and then it was Angel, Pipia and Rolly flying up along the track between the hotels and the ocean! Pipia was the surprise; he had finished over a minute behind Rolly in Lexington. Perhaps that had been an off day and he was looking for redemption? With the sunrise casting visible shadows, Angell, in the lead, was able to see that as they approached the 3 mile mark, Rolly was starting to struggle with the pace, as a gap started to develop. Then it was just the two of them. Just before the turn off of the Boardwalk over to Atlantic Avenue, the shadows showed a small gap between Angell and Pipia. Turning it on up Atlantic and back onto the boardwalk, Angell kept the turnover high and came home a winner for the 2nd year in a row in 25:39 (gun). Pipia had no trouble holding off Rolly and came 2nd in 24:46. Rolly was 11 seconds back in 3rd. 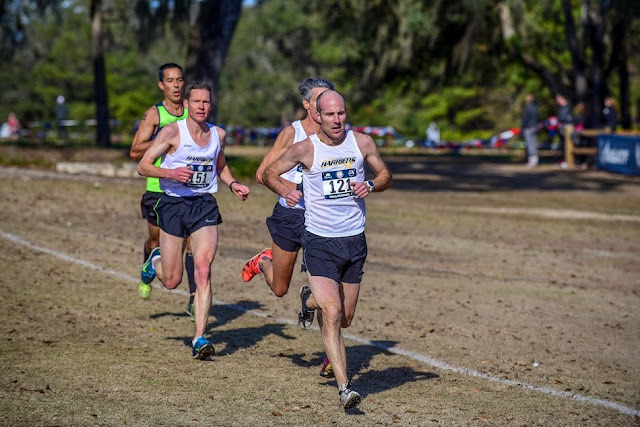 Teigen was able to narrow the gap up to Rolly slightly but had too much ground to make up, finishing 4th in 26:05, 4 seconds ahead of his teammate, Frieder. Tompkins paid a little price for his early speed, falling back to 6th but held off Lemme, Nat Larson, Gwanzura and Mark Hixson who rounded out the top 10. 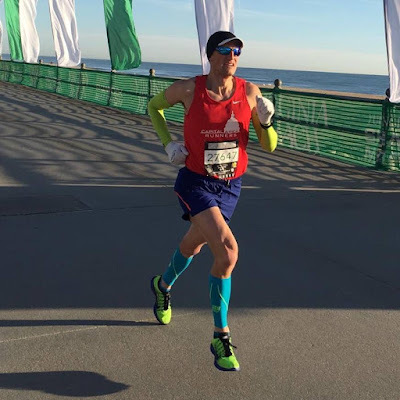 Angell noted that he was pleased with the win, especially because of training time lost in late January and early February to an accidental non-running spill resulting in a knee injury. Marisa Sutera Strange was looking to repeat her trip to the podium but she hoped for something better than her third place finish last year. 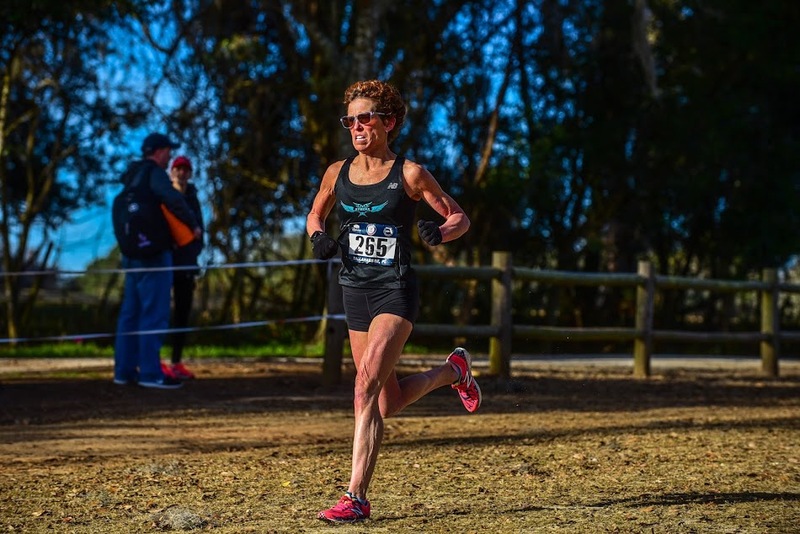 Her main rivals appeared to be her Athena teammate, Doreen McCoubrie, who took 4th last year, GVH’s Heather Webster, who bested Strange at Club XC in 2016, and a relative newcomer to the Championship Masters Grand Prix circuit from Utah, Michelle Simonaitis, who tested the waters at the 2016 Half Marathon championship in San Diego. Simonaitis was a frequent competitor at Masters Championship events from 2006 to 2010; it is good to see her back in action. Her recent efforts in the Salt Lake City Original Winter Series suggested she might well be competitive here. Those four, along with Michelle Brangan, Suzanne LaBurt, and Jessica Riggs were tight for the first mile. In the 2nd mile Strange began to gradually pull away, enjoying a seven second margin on Simonaitis when she crossed the 2 mile mat in 12:20. It was 5 seconds back to McCoubrie and Webster who were still running in tandem, with a bigger gap back to Brangan, Riggs and LaBurt, who crossed between 12:42 and 12:50. Strange powered up the Boardwalk, adding second on second to her margin. Webster was locked on Simonaitis and would not let her get away but could not close the gap either. Simonaitis said later that she thought she had gone out a little too fast. But she should be proud of how well she maintained her pace through the remainder of the race. McCoubrie gradually fell back from Webster but enjoyed a growing gap back to Brangan, Riggs, and LaBurt. Strange hit the finish line in 30:40, enjoying a 40 second margin of victory. Despite her best efforts, Webster could not catch Simonaitis who remained strong all the way to her finish in 31:20, with 4 seconds on Webster. Fifteen seconds later McCoubrie came across, claiming a 2nd straight 4th place finish. It was the better part of a minute back to Brangan, Riggs, and LaBurt who finished 5th, 6th, and 7th respectively. That’s it for now. Next up will be recaps of the Age Division and Team National Championships.